Block 6 will be the next part of the OHSU Schnitzer Campus to be built out. The building will front onto SW Bond Ave, which is currently under construction. 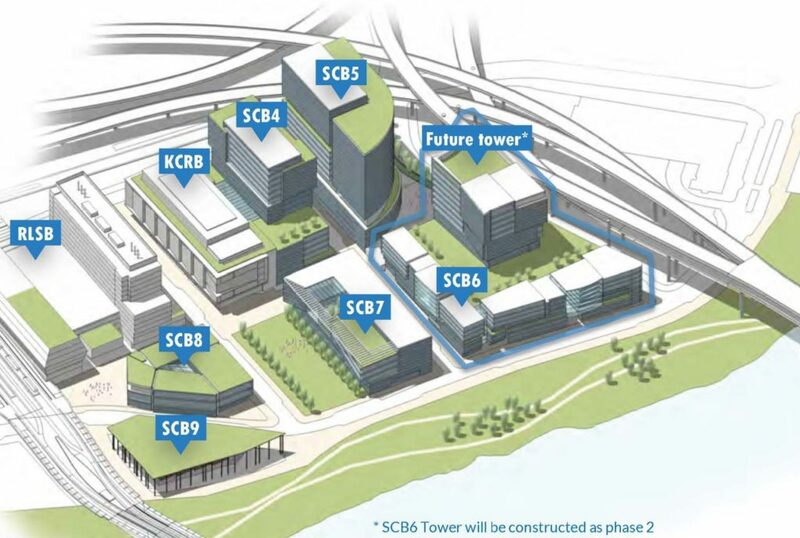 The Portland Business Journal reported on the OHSU Schnitzer Campus Block 6, which form the next phase of the hospital’s South Waterfront development (subscription required). The hospital intends to build a $75 million parking structure with 1,200 spaces. 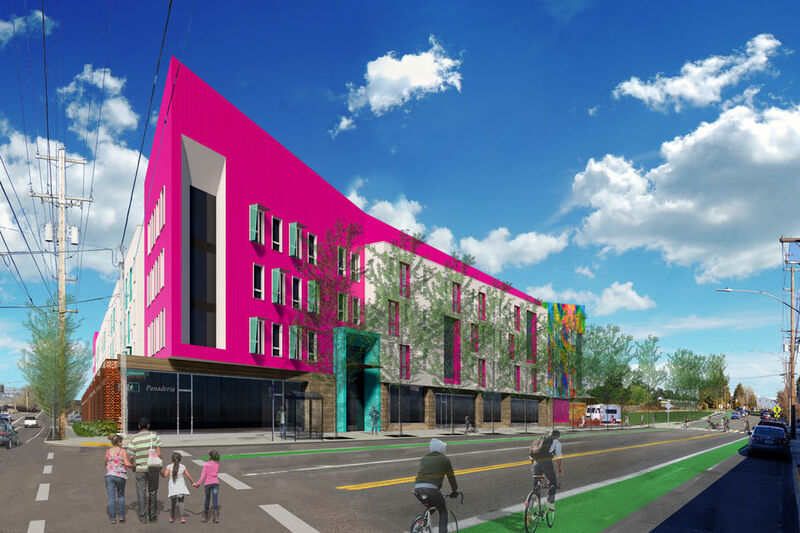 The Portland Housing Bureau and a developer will fund the construction of a $40 million 121-unit affordable housing component. The PAE Living Building proposal for Old Town drew praise* from the Historic Landmarks Commission, writes the Daily Journal of Commerce. The Oregonian wrote about the Holden of Pearl, the senior living tower proposed in the Pearl District. Craig Cheek of the Portland Diamond Project spoke to the Oregonian about the baseball stadium, ticket prices and state bonds. Prosper Portland is moving forward with design work on an office building to be built on top of the parking garage currently under construction across from the Convention Center. Prosper Portland intends to move forward with an office building on top of the garage adjacent to the Convention Center Hotel, reports the Oregonian. 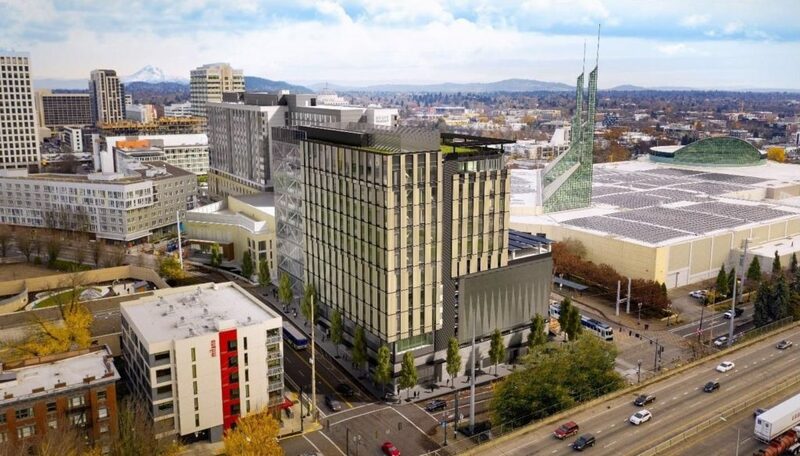 The 100 Multnomah office building would add 118,000 square feet of rentable office space on top of the currently under construction parking garage. The Daily Journal of Commerce wrote about the Pearl Neighbors for Integrity in Design,* who are fighting the proposed Hyatt Place at NW 12th and Flanders. Bloomberg wrote about Portland’s opportunity zones, which include most of Downtown, the Pearl and the Central Eastside. A part of the 2017 federal tax overhaul, the zones allow investors to reduce taxes on capital gains—with investments held for 10 or more years exempt from capital gains tax. The Portland City Council approved financing for the N Williams Center, reports the Portland Mercury. The 61-unit apartment building will include 40 units for renters who earn less than 30 percent of area median income (AMI) and 20 units for those earning less than 60 percent AMI. 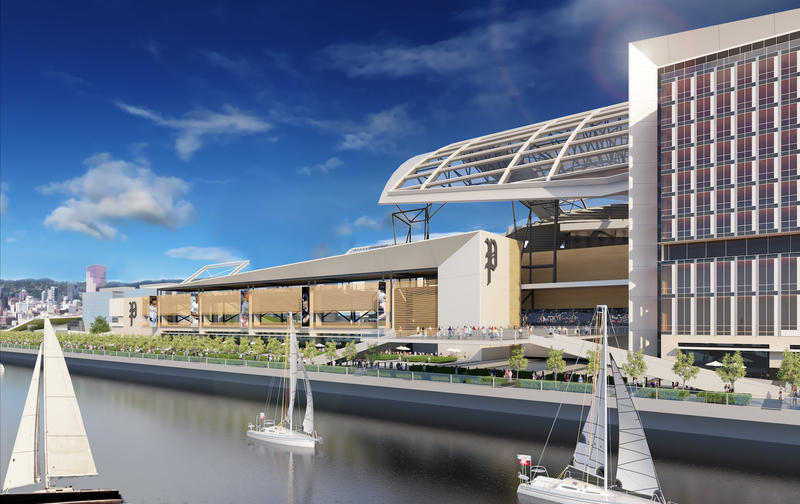 The charter investors backing the Portland Diamond Project were revealed. The Ecotrust has completed work on the Redd on Salmon Street, reports the Portland Business Journal. The food business incubator and last-mile distribution warehouse already serves more than 170 food businesses and five core tenants. Multnomah County intends to purchase the Modish Building at 333 SW Park, for use as a mental health and addiction resource center. A previous proposal for the 4-story building would have seen it converted into creative office space. The Portland Business Journal took a first peek at the Rood Family Pavilion, the “cool new guest house for OHSU Doernbecher families“. The Albina Vision would include a new waterfront public space, at the concourse level of Veterans Memorial Coliseum. The park would span over N Interstate Avenue and the freight rail line. The Daily Journal of Commerce wrote about the Albina Vision, an effort by civic leaders to heal the district with intentional development that reverses displacement, with new public spaces, mixed income housing and cultural buildings. Proposed legislation could eliminate a potential funding source for the Portland Diamond Project, writes the Willamette Week. A Bowlero-branded bowling alley is proposed for the Lloyd Center, according to the Oregonian. The Hyatt Regency at the Oregon Convention Center is already attracting attention in Portland — and beyond, according to the Business Tribune. 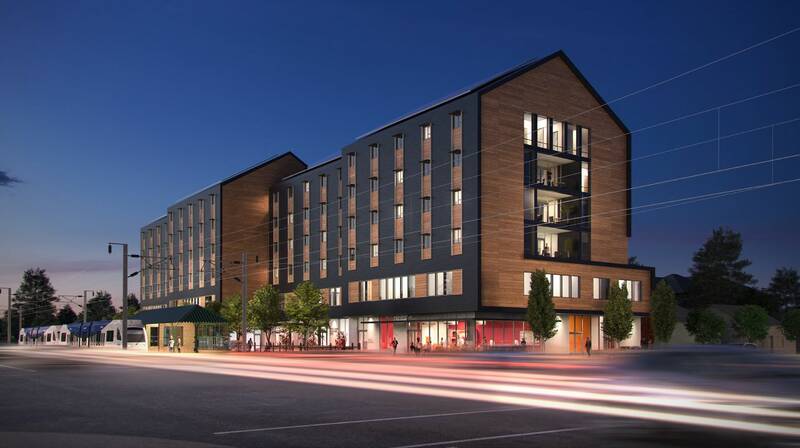 The Design Commission has approved the Grand Avenue Mixed Use, a 170-unit building in the Central Eastside, writes the Oregonian. Portland Architecture had a conversation with Holst Architecture principal Dave Otte about the firm’s transition to new leadership. 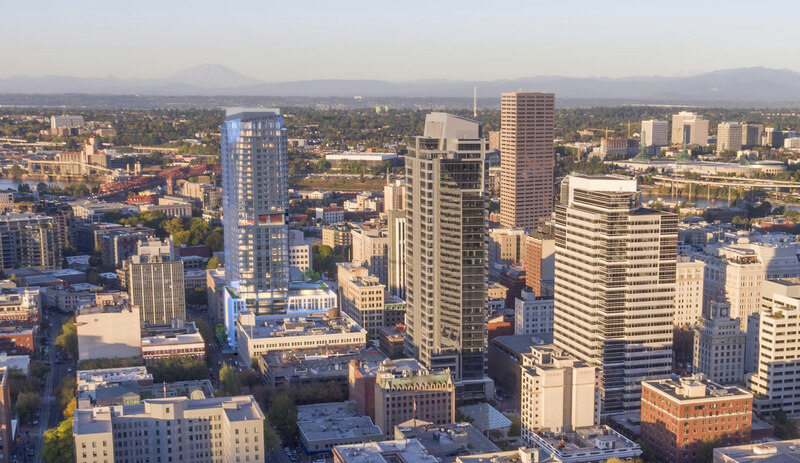 The Hyatt Place in the Pearl would likely be the city’s tallest building to have no on-site parking, according to Portlanders for Parking Reform. 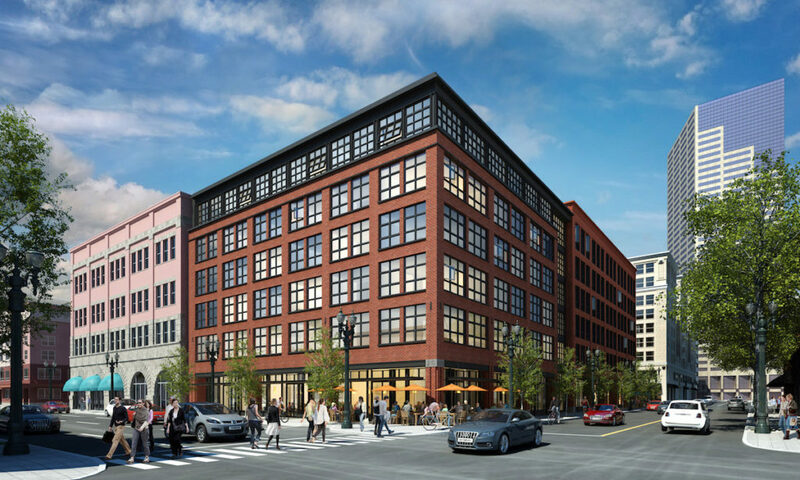 The Oregonian reports that ground has been broken on the Fourth and Montgomery Building, the downtown classroom, clinic and office building that will house programs of three higher education institutions and Portland’s city government. The Oregon Harbor of Hope could be open by this summer. Originally planned as private endeavor, the shelter and navigation center will receive $1 million in funding from the Joint Office of Homeless Services, reports the Oregonian. The proposed Hyatt Place at NW 12th and Flanders would rise to a height of 250′, with 10 floors of hotel rooms and 12 floors of residential units. The 23-story Hyatt Place proposed in the Pearl went in front of the Design Commission last week—where it drew strong opposition from neighbors,* according to the Daily Journal of Commerce. At the same hearing the Commission also approved the Grand Avenue Mixed Use apartments. Tope, the new rooftop taco bar from the folks behind Ava Gene’s, is now open in the Hoxton Hotel, reports Eater Portland. The Willamette Week reported that Oregon could become the first state in the nation to institute statewide rent control. Las Vegas high-end chocolate shop Jinju Chocolates is opening a store in The Silica on N Williams, writes Eater Portland. The Business Tribune wrote about the major renovation underway at the headquarters of the Nature Conservancy at SE 14th & Belmont. The Blackburn Building is currently under construction at E Burnside and 122nd. One month after topping out, the new Multnomah County Central Courthouse is taking shape inside and out, reports the Business Tribune. The Oregonian obtained the terms of the agreement between the Portland Diamond Project and the Port of Portland. Central City Concern’s Charlotte B. Rutherford Place is now open. The Daily Journal of Commerce wrote about Charlotte B. Rutherford Place, a 51-unit apartment complex in Arbor Lodge that aims to provide affordable housing for people with ties to the area*. The Oregonian reported that the Portland Online Permitting System (POPS) will “save time, frustration, but might be finished late, over budget“. According to the Portland Mercury new owners are set to take over SE Portland bar Hanigan’s Tavern, also known as The Vern. 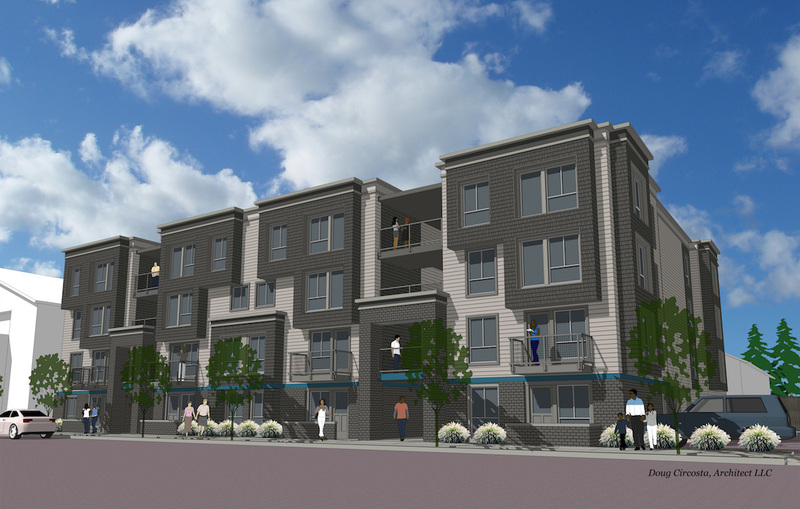 An early assistance application had previously been submitted to redevelop the site at 2628 SE Belmont St with a 44-unit, apartment building. The Oregonian reported that the City’s annual State of Housing Report showed record levels of apartment construction helped slow rents increases. Housing however remains out of reach for many in the city. 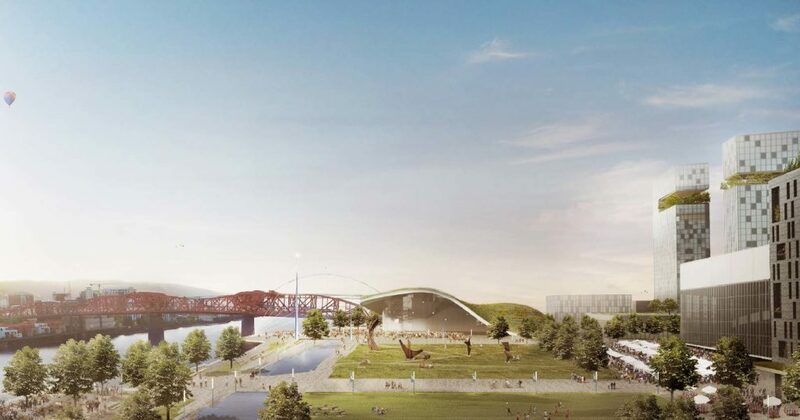 OPB covered how Oregon’s love of industrial land will affect the ability of the Portland Diamond Project to build a baseball stadium at the Terminal 2 site. The 35-story Block 216 tower will rise to a height of 460′ and include retail, office space, hotel rooms and residential condominiums. 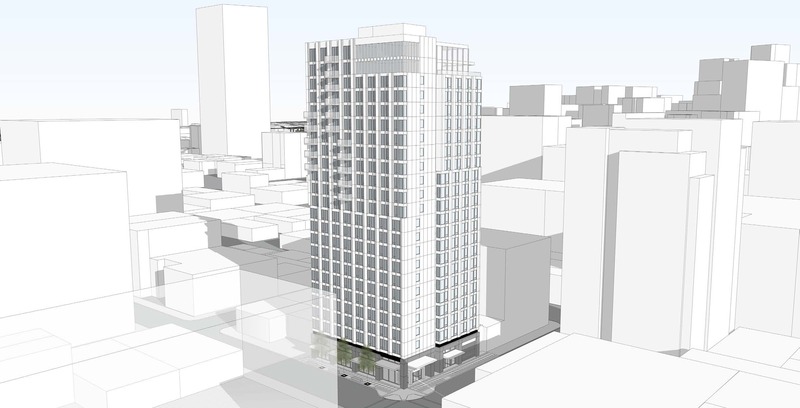 The Design Commission last week approved* Block 216, writes the DJC. In a late change by the applicant, the tower will now have one less office floor and one more hotel floor, bringing the number of hotel room from 232 to 249. After years of construction work, The Woodlark hotel, which combines two historic buildings, opened downtown. The Oregonian took a first look inside, and previewed Bullard, ‘Top Chef’ finalist Doug Adams’ Texas-inspired Portland restaurant. In response to “quite sobering” forecast for Portland building trends, the Bureau of Development Services last week laid off four employees, writes the Oregonian. Closed for two and a half years, Taiwanese restaurant Ling Garden has reopened in the the 21 Astor building, reports the Portland Mercury. Portland is poised to spend revenue from lodgings and rental car taxes on services to help homeless people, reports the Willamette Week. The money is needed to help fill a funding gap in the recently passed Metro housing bond. Oregon could become the first state to eliminate single family zoning, under a proposal by Speaker Tina Kotek. The legislation would require that allow Oregon cities of 10,000 people of more allow duplexes, triplexes or fourplexes, according to the Willamette Week.